"Anicca" redirects here. For the album by Merzbow, see Anicca (album). Impermanence, also called Anicca or Anitya, is one of the essential doctrines and a part of three marks of existence in Buddhism. The doctrine asserts that all of conditioned existence, without exception, is "transient, evanescent, inconstant". All temporal things, whether material or mental, are compounded objects in a continuous change of condition, subject to decline and destruction. Anicca or impermanence is understood in Buddhism as the first of three marks of existence, the other two being dukkha (suffering, pain, unsatisfactoriness) and anatta (non-self, non-soul, no essence). All physical and mental events, states Buddhism, come into being and dissolve. Human life embodies this flux in the aging process, the cycle of repeated birth and death (Samsara), nothing lasts, and everything decays. This is applicable to all beings and their environs, including beings who have reincarnated in deva (god) and naraka (hell) realms. This is in contrast to nirvana, the reality that is Nicca, or knows no change, decay or death. Impermanence is intimately associated with the doctrine of anatta, according to which things have no essence, permanent self, or unchanging soul. The Buddha taught that because no physical or mental object is permanent, desires for or attachments to either causes suffering (dukkha). Understanding Anicca and Anatta are steps in the Buddhist’s spiritual progress toward enlightenment. The Pali word anicca is a compound word consisting of "a" meaning non-, and "nicca" meaning "constant, continuous, permanent". While the word 'Nicca' refers to the concept of continuity and permanence, 'Anicca' refers to its exact opposite; the absence of permanence and continuity. The term appears in the Rigveda, and is synonymous with Anitya (a + nitya). The term appears extensively in the Pali canon. what we want them to be. its abandoning, relinquishing, releasing, letting go. Annica doctrine is one of the foundational premises of Buddhism, which asserts that all physical and mental events are not metaphysically real, that they are not constant per permanent, they come into being and dissolve. Impermanence is one of trilakshana (three marks) of existence. It appears in Pali texts as, "sabbe sankhara anicca, sabbe sankhara dukkha, sabbe dhamma anatta", which Szczurek translates as, "all conditioned things are impermanent, all conditioned things are painful, all dhammas are without Self". Everything, whether physical or mental, is a formation (Saṅkhāra), has a dependent origination and is impermanent. It arises, changes and disappears. According to Buddhism, everything in human life, all objects, as well as all beings whether in heavenly or hellish or earthly realms in Buddhist cosmology, is always changing, inconstant, undergoes rebirth and redeath (Samsara). This impermanence is a source of Dukkha. This is in contrast to nirvana, the reality that is Nicca, or knows no change, decay or death. The term Anitya (अनित्य), in the sense of impermanence of objects and life, appears in verse 1.2.10 of the Katha Upanishad, one of the Principal Upanishads of Hinduism. It asserts that everything in the world is impermanent, but impermanent nature of things is an opportunity to obtain what is permanent (nitya) as the Hindu scripture presents its doctrine about Atman (soul). The term Anitya also appears in the Bhagavad Gita in a similar context. Buddhism and Hinduism share the doctrine of Anicca or Anitya, that is "nothing lasts, everything is in constant state of change"; however, they disagree on the Anatta doctrine, that is whether soul exists or not. Even in the details of their respective impermanence theories, state Frank Hoffman and Deegalle Mahinda, Buddhist and Hindu traditions differ. Change associated with Anicca and associated attachments produces sorrow or Dukkha asserts Buddhism and therefore need to be discarded for liberation (nibbana), while Hinduism asserts that not all change and attachments lead to Dukkha and some change – mental or physical or self-knowledge – leads to happiness and therefore need to be sought for liberation (moksha). The Nicca (permanent) in Buddhism is anatta (non-soul), the Nitya in Hinduism is atman (soul). The five aggregates, monks, are anicca, impermanent. Akio Jissoji's Buddhist auteur film Mujo (also known as This Transient Life) owes its title to the doctrine of Impermanence. 1 2 3 4 5 6 7 8 Thomas William Rhys Davids; William Stede (1921). Pali-English Dictionary. Motilal Banarsidass. pp. 355, Article on Nicca. ISBN 978-81-208-1144-7. 1 2 Richard Gombrich (2006). Theravada Buddhism. Routledge. p. 47. ISBN 978-1-134-90352-8. , Quote: "All phenomenal existence [in Buddhism] is said to have three interlocking characteristics: impermanence, suffering and lack of soul or essence." 1 2 Robert E. Buswell Jr.; Donald S. Lopez Jr. (2013). The Princeton Dictionary of Buddhism. Princeton University Press. pp. 42–43, 47, 581. ISBN 978-1-4008-4805-8. 1 2 Robert E. Buswell Jr.; Donald S. Lopez Jr. (2013). The Princeton Dictionary of Buddhism. Princeton University Press. pp. 47–48, Article on Anitya. ISBN 978-1-4008-4805-8. Grant Olson (Translator); Phra Payutto (1995). Buddhadhamma: Natural Laws and Values for Life. State University of New York Press. pp. 62–63. ISBN 978-0-7914-2631-9. 1 2 Damien Keown (2013). Buddhism: A Very Short Introduction. Oxford University Press. pp. 32–38. ISBN 978-0-19-966383-5. 1 2 Peter Harvey (2012). An Introduction to Buddhism: Teachings, History and Practices. Cambridge University Press. pp. 32–33, 38–39, 46–49. ISBN 978-0-521-85942-4. ↑ [a] Christmas Humphreys (2012). Exploring Buddhism. Routledge. pp. 42–43. ISBN 978-1-136-22877-3. [b] Brian Morris (2006). Religion and Anthropology: A Critical Introduction. Cambridge University Press. p. 51. ISBN 978-0-521-85241-8. , Quote: "(...) anatta is the doctrine of non-self, and is an exteme empiricist doctrine that holds that the notion of an unchanging permanent self is a fiction and has no reality. According to Buddhist doctrine, the individual person consists of five skandhas or heaps - the body, feelings, perceptions, impulses and consciousness. The belief in a self or soul, over these five skandhas, is illusory and the cause of suffering." [c] Richard Gombrich (2006). 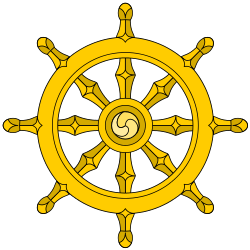 Theravada Buddhism. Routledge. p. 47. ISBN 978-1-134-90352-8. , Quote: "(...) Buddha's teaching that beings have no soul, no abiding essence. This 'no-soul doctrine' (anatta-vada) he expounded in his second sermon." ↑ Brian Morris (2006). Religion and Anthropology: A Critical Introduction. Cambridge University Press. pp. 51–53. ISBN 978-0-521-85241-8. 1 2 3 Ray Billington (2002). Understanding Eastern Philosophy. Routledge. pp. 56–59. ISBN 978-1-134-79348-8. ↑ John Whalen-Bridge (2011). Writing as Enlightenment: Buddhist American Literature into the Twenty-first Century. State University of New York Press. pp. 154–155. ISBN 978-1-4384-3921-1. ↑ Rupert Gethin (1998). The Foundations of Buddhism. Oxford University Press. p. 74. ISBN 978-0-19-160671-7. 1 2 3 4 Richard Francis Gombrich; Cristina Anna Scherrer-Schaub (2008). Buddhist Studies. Motilal Banarsidass. pp. 209–210. ISBN 978-81-208-3248-0. ↑ Paul Williams (2005). Buddhism: Buddhism in China, East Asia, and Japan. Routledge. pp. 150–153. ISBN 978-0-415-33234-7. ↑ Damien Keown (2004). A Dictionary of Buddhism. Oxford University Press. p. 15. ISBN 978-0-19-157917-2. ↑ Max Muller (1884). The Upanishads. Oxford University Press (Reprinted Dover Press, 2012). p. 9, verse 1.2.10. ISBN 978-0-486-15711-5. 1 2 Frank Hoffman; Deegalle Mahinda (2013). Pali Buddhism. Routledge. pp. 162–165. ISBN 978-1-136-78553-5.